The What: Marshall Electronics has shipped its VSW-2200 Seamless Switcher. Marshall’s Seamless Switcher allows smooth transitions between camera views, allowing it to be used in live broadcasts, teleconferences, or live-streamed events. The switcher will be demonstrated as one of Marshall’s Unified Communications solutions at ISE Amsterdam. The VSW-2200 Seamless Switcher is intended for small to medium-sized conferences or productions requiring up to four cameras. The switcher has four inputs and supports auto-switching between 3G/HD/SD-SDI formats. The VSW-2200 is controllable via RS-232 or IR remote control, supports re-clocking and equalization. The VSW-2200 has an SDI out and its firmware is upgradable via the RS-232 port. 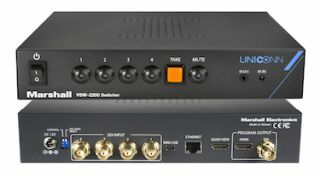 The VSW-2200 is the first component of the new UNI-CONN line of communications products designed specifically for the Unified Communications market. This collection of products addresses audio and video needs with a collection of interchangeable components designed to work with a variety of teleconferencing systems and software. Solutions include Marshall POV Pro-Series Cameras with HD-SDI outputs. Up to four Marshall POV Pro-Series cameras can be fed into the VSW-2200 switcher. The SDI output can then be converted to USB 3.0 using Marshall’s VAC-11SU3 converter for videoconferencing. Individual cameras and microphones are interchangeable, allowing the user to customize an affordable, versatile solution. The Bottom Line: Marshall’s Unified Communications components will be demonstrated at ISE Amsterdam booth 11.F60. The VSW-2200 Seamless Switcher and Marshall POV Pro-Series Cameras are available now.